What is Eye pressure test? It is a well-known fact that most medical conditions are much easily treated if they are caught in their early stages. Ocular conditions are no exception – especially since some of the most common diseases show little to no observable symptoms before they hit very hard. Thus, a regular eye exam becomes vital, even for those with perfect vision. Along with the traditional tests performed in this annual eye exam, there is one more which should not be skipped by any means: an eye pressure check. We’d like first to explain what eye pressure is. There are two kinds of fluids inside the human eye. Vitreous humor in the back, behind the lens, and aqueous humor in the front. Being liquids, they give the eye a specific “resistance” which can be felt much like that of a balloon – by poking it with an object (your finger, in the case of the balloon) and gauging the resistance. In the case of the human eye, a small device which shoots out air is preferred. For measuring this pressure, a unit called millimeters of mercury (mmHg) is used. The standard value for mmHg is between 10 and 21. Thus, we can conclude that pressure in the human eye, called intraocular pressure (IOP) is considered “normal” between these two measures. High IOP causes issues with the optic nerve in most patients, which can lead to glaucomatous vision loss. While this high pressure isn’t always disease inducing, it does pose a high risk for developing glaucoma or converting from ocular hypertension (Elevated IOP) to glaucoma. Eye pressure test is important because abnormal pressure usually has no symptoms unless in certain extremely elevated cases, so is important to uncover such abnormality. When developing open angle glaucoma, a patient doesn’t experience anything like red eyes or other symptoms, just a small peripheral vision loss which worsens over time and isn’t immediately noticeable. Thus, even people with perfect vision should take this eye test on regular basis. 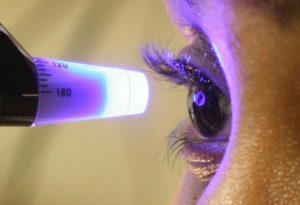 Glaucoma, when caught early, can be treated medically. Eye trauma or certain eye surgeries (like cataract) are also known cause potential eye pressure abnormalities. There are also certain demographics of people who are known to be at a higher risk of developing IOP abnormalities, such as those of African-American descent, those over 40 years of age, those suffering from nearsightedness and diabetes. Moreover, some studies have shown that prevalence is more in women. To sum up, a regular eye pressure check is a no-stress, non-invasive and easy way to catch one of the most serious ocular conditions in its early stages. Eye pressure is also used to gauge the efficacy of a treatment when managing glaucoma. The yearly test is covered by most insurance plans and can be done at your local optometrist, so there is no reason to skip it in any way. To schedule an Eye Exam with one of our optometrists please call or email our Scarborough office today.